*this is my second post today.. please click here for the Hollydays with Right at Home post. 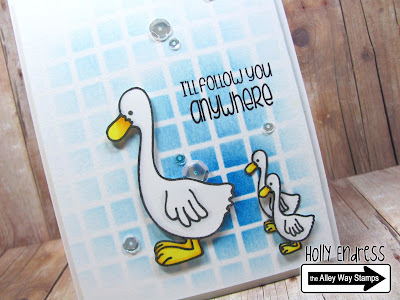 It's time for some more cute fun with the Alley Way Stamps.. today I'm using the cute new set Just Ducky! I created the background using a stencil from MFT and some Distress ink on a piece of watercolor paper. I stamped the ducks onto some White card stock using some Tuxedo Black ink from memento and colored them in with Copics. I adhered the Background panel to a top folding White card base using some dimensional adhesive. I stamped the sentiment in the corner near the ducks with some Black ink. For a little touch of Bling.. and because I can't not have sequins lol I added some Sparkling clear sequins from Pretty Pink Posh. Head over to the Alley Way Stamps blog for more fun inspiration.